People find this place rather nice! Average score: 5.5 by 1026 random voters. Probably that there stood yet since the year 1000 at this place a donjon on this rock, that looks upon the valley of the 'witte water' (Eau Blanche-White water). Unfortunately there are no remains left. During the 13th and 14th century there were talks about a castle with several towers. But also about this there are no real proofs about the exact emplacement or the exact look. In 1486 the principauty of Chimay was erected officially by Maximilian I of Austria. From the 16th century on we have exact data.There are bills for restaurationworks dating from 1567. The registers land registry and the family documents of Cro� prove the existing of the castle round 1590 and give an idea of how it looked like.Yet in this period there was a roof with a tower with peerspire. Charles III of Cro� gave a description of the principauty in 1606 : 'La Description de la terre, chasteau, ville, principault� et payrie de Chymay'. In between there took great works place, and the speerspire disapeared. At that moment there is a completely renewed palay-castle with a square ground and five towers. Further Charles III of Co� had let restaure the town walls.The town connectedd with the castle with a big drawbridge. The lot was a strong military construction. These works were to be quite useless: the war in the period 1637-1648 had destroying consequencies. 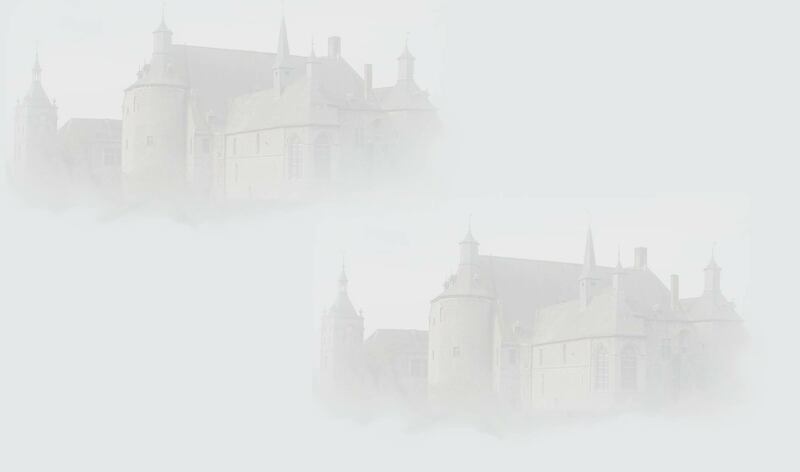 In 1638 the castle was completely burnt down and the remains blown up by the French troups. During the time of peace following the family restaurated the castle partially, but as the time go by the military aspect dispappeared. By 1750 the castle moats and walls were gone. Yet in 1805 there was a theater there. Then came the night of 5 to 6 may 1935. A short-circuit caused a fire that lays all into ashes.The restauration was started quickly with respect for the sources from the beginning of the 17 th century, in renaissance style. The theater is the most spectacular piece of the interior of the castle. This was dated from 1863 (although after the fire it was restaured), but in fact it is a copy of the theater in Fontainebleau. This theater was and is used for several musical presentations (amongst them the festival of barok music), which is also attented by royal people.The statue of a musician above the porche of the castle shows the love for the music by the princes of Chimay. The first prince of Cro� oredered yet in 1500 a famous music festival held for the baptism of his son Philippe. The chapel, now located in the medieval tower, is still in use for several occasions(such as the baptism of the children in the family).It contains still a remembrance for the fact that the famous shroud of Christ was kept here ( what occasionned many disputes between the bishops). Tha land whereon the abbey of Chimay (from the famous beer)is located was a gift of the princes to the munks. 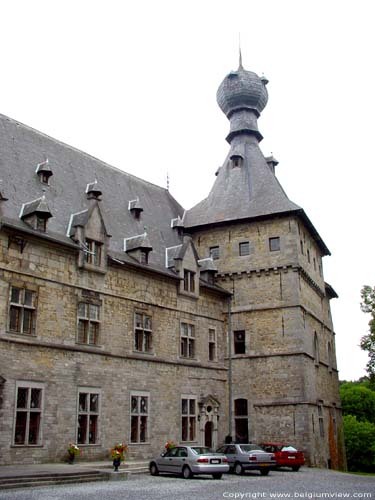 This brings us to an interresting story: during the second worldwar the complete population of Chimay sheltered in the castle.The munks also stayed there a long time. They have drawn a cross on the wall.This was saved later as a symbol for the hospitality of the family of the princes and for the fact that the old big buildings from the patrimonium are at the dispositon (os should be) of the people. Above the doorway of the castle hangs also a small bell. This used to be used to call the children inside for the meals. Especial to a visit to a castle is it when you are guided by the prince himself and even that he is sometime ready for a little chat with the visitors.